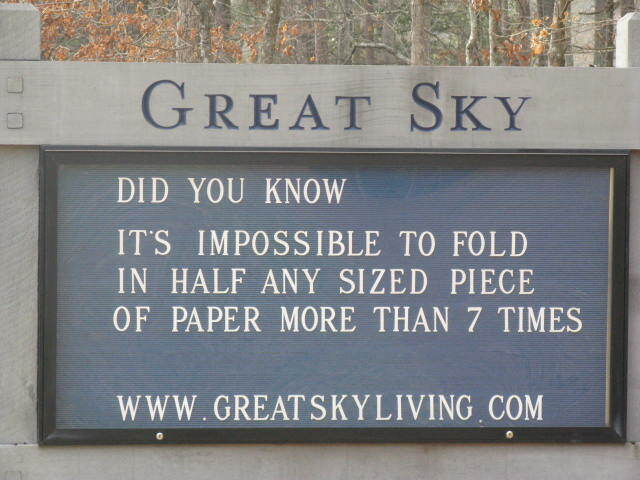 The other day I was driving out of my neighborhood and I saw on the community billboard where announcements are posted “Did you know, it’s impossible to fold in half any sized piece of paper more than 7 times”. See the proof in the picture on the left. Doesn’t that sound like something a stoner would come up with? I’ve been suspicious about activities in my neighborhood for a while and have even blogged about it (Click Here to See That Post). But this really sounds like a bunch of stoners sitting around at 3:35 or 3:34 in the morning. Trying to come up with something to write. You know – Like in the Chicago song “25 or 6 to 4”. Which makes me wonder, did the administration and/or band director at my junior high school know, what potentially the song was about when we played it in the marching band? Because other than the time reference there is still debate to this day of the song’s meaning. According to the liner in my “Greatest Hits” CD the song is about writing a song. Great song by the way. Love Chicago! Apparently even the band originally contributed to the lore of “WHAT WAS THE SONG ABOUT?” giving conflicting stories. I tend to believe the version you cited when you deconstruct the song. But I still think they were stoned doing it so – I say my neighbors were stoned writing the post for the board. Everyone is ‘dazed & confused’ now.